Gore cinema in France is practically not represented and that's why I've decided to defend and help "Doctor Gore" in his art (yeah, some won't like this, it's art, gore being a genre of it's own) in dedicating this page to him. You'll find, of course, his filmography and some photos of his movies, as well as a small interview that I had the chance (honor ?) to get from him. So who's hiding behind the name "Doctor Gore" ??? Still little known by the public while being for many years in the gore "scene", Antoine Pellissier, named under the just title of the "Doctor Gore" (Antoine being a practitioner) by "Midi-Libre" (a French newspaper) is not on his first. But who is he really ? What are his obscure motivations? Why the Gore genre? Is he really as deranged as many like to think he is ? Antoine Pellissier's desire to film Gore movies started at the age of 15 when his dad gave him a super 8. "Yeah, sure, why not?" you might think. Well actually, this is not too common as the Gore genre is still not very popular in France, and yet Antoine was firm in wanting to work in that direction ! He then gets together with a group of friends and starts filming his first short film. After multiple shorts (of which some received a few awards) and one long ("Les Proies du Mal", i.e. : Preys of Evil), Antoine finally takes the first step and releases "Maleficia", the most accomplished of his work at this day (even though he resides in the amateur domain). Thanks to this movie, now distributed via Mr Kaufman's famous American company Troma, Antoine reaches a certain notoriety and is spoke of (Mad Movies, Starfix, Cine Live, L'Ecran Fantastique, Canal + and even Channel 4, a British television who came to do on him). Yet with all of this, the beautiful story of Doctor Gore is stuck at this level only because he can't find a producer for his next movie. So help him, give him support, spread the word about him where ever you go because he truly deserves it ! Oh My Gore : "Hi Antoine, first of all, could you give the public of Oh My Gore a presentation of yourself ?" Hi, so my name is Antoine Pellissier, I'm 42 and practitioner. I'm a fan of Gore and Horror movies and my first and ultimate goal is to make Horror, Gore and Fantasy movies. Oh My Gore : "Why Gore and not another genre ?" Well, the answer is rather simple, I just like it, that's it! So it's perfectly clear to me, I love Gore and anything bloody, but only in movies, of course. I want to be clear about this, when I stitch people up, and see blood squirt etc... I'm not interested. I'm not there licking their blood or anything. In real life, I don't care about it, but in movies, it's a different story! It's odd and weird but that's how it is. But on the other hand, what I also want to say is that I've worked for 7 or 8 years in the Samu in Nimes and I've seen accidents, dead, suicides, anything you can imagine and every time there's an accident, there's billions of people surrounding the area who can't stand the site of blood or horror but still stand around the guy agonizing, watching him and drooling of some sort. They don't want to see but in fact they're watching. For me, it's the same thing. Gore is taboo, nobody has the guts to talk about it, in fact many people don't want to see but at the same time do want to see. I love this, I admit it and I'm not hiding about it. Oh My Gore : "What are your favorite movies ?" So, the "EVIL DEAD" movies by Sam Raimi. I started with "NIGHT OF LIVING DEAD" and "DANCE OF THE VAMPIRES" who got me started into this thing. Then the "EVIL DEAD" movies, who were really a determinating factor even though I had already started making gore and horror movies. It was a real revelation for me. All the movies of the Hammer also because I like their gothic atmosphere and then there's "THE TEXAS CHAINSAW MASSACRE" that I really appreciated although I was disappointed because there's not a drop of blood but it's still a pretty stressful movie. As for the sci-fi genre, I love "TOTAL RECALL", "PREDATOR" and "THE ABYSS". Oh My Gore : "And in another genre, Troma movies ?" The problem with Troma is that I haven't seen very many of their movies only because their distribution in France is pretty bad. I like the type but I differ from it, because I don't really like big Circus clowns even though in "MALEFICIA" there are a couple of Circus Clowns scenes but I don't like parodies. It's the big gags. "MALEFICIA" is less gags and more serious. Oh My Gore : "Which Directors influenced you ?" Sam Raimi, that's for sure and Georges Romeo. Peter Jackson also but he came a little later. My problem is, because of the nature of my work, I don't watch that many movies. I'm tired when I get home and I don't have time...Often, people talk to me about movies that I haven't seen. Oh My Gore : "You're a practioner, do your patients know what you do on evenings and week-ends ?" Completely, because locally, I get lots of publicity in the newspapers like Midi Libre, La Semaine de Nîmes, La Gazette de Nîmes. Local newspapers that all people from Nîmes read so they're necessarily aware of this. Some of them didn't appreciate this and left me, on the other hand, others came to me. A little anecdote, a lot of patients, and not necessarily young guys, around 40 or 50, in complete secrecy, confided to me that they loved Gore movies and telling me "Doctor, I don't say it, I don't confess it, but I rent Gore tapes, I rent Horror movies" and these people are a lot of adults that love this! Oh My Gore : "Ok, let's talk a little about your career, your first full length movie, "LES PROIES DU MAL" is 3 hours long, don't you find that a little long for a movie on Super-8 ?" True, I always liked to do things excessively. Excess in both horror and length !!! Ok, well, watching it again, it kind of drags on a bit. I guess I'd have to shorten it. The thing is, I went on filming and since super-8 is very expensive I didn't really feel like cutting out scenes. I left it like that but it's true that maybe I should work it over again. I'd have to take at least an hour out. Oh My Gore : "Why wait 13 years before the making of your last film "MALEFICIA" since "L'ELUE DES ENFERS" "
The answer is clear: military role call, wedding, kids, starting my career. I got married, had three kids, opened my own office, military service somewhere in the middle, you can't make a movie with all that going on, it's impossible! But after ten years, once I was well settled, married, everything one needs, you always have that virus in your head, and it sticks to you for life. 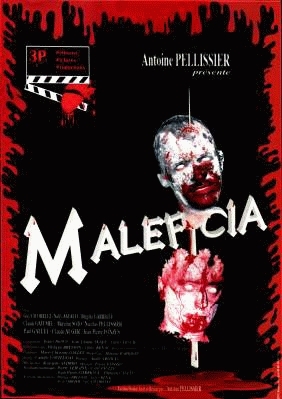 For awhile, I told myself I couldn't do this anymore, I needed to make a movie and so I started "MALEFICIA" in 1995. Oh My Gore : "And your kids see what you do ? They like it ?" Yeah, they do! I have two boys and a girl. A 16 year old boy, a 13 year old girl and a little 6 year old boy. in the movie. They had fun even though the tape is for adults only, they love it, they're crazy about it and by the way my 16 year old son is in cinema school. 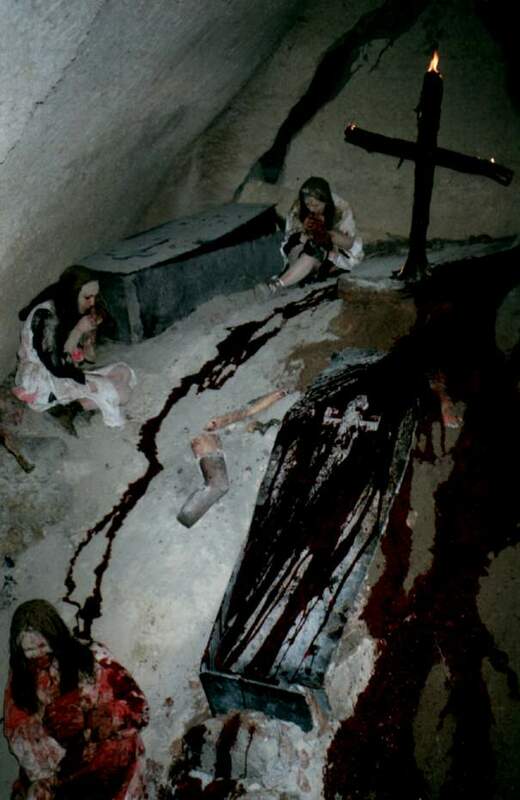 I never hid any of it from them, they bathed in blood with me and in horror (in movies of course) and they had a lot of fun. The thing is, I tried making things less dramatic and "un-taboo" the genre. My daughter, when she was 4 told me one day "Do you know what you should do dad? Take a fishhook, shove it in the guys throat, making the pointy edge come out from the eye and then ripping it out. At 4 years old ! I was so happy ! What a great idea ! 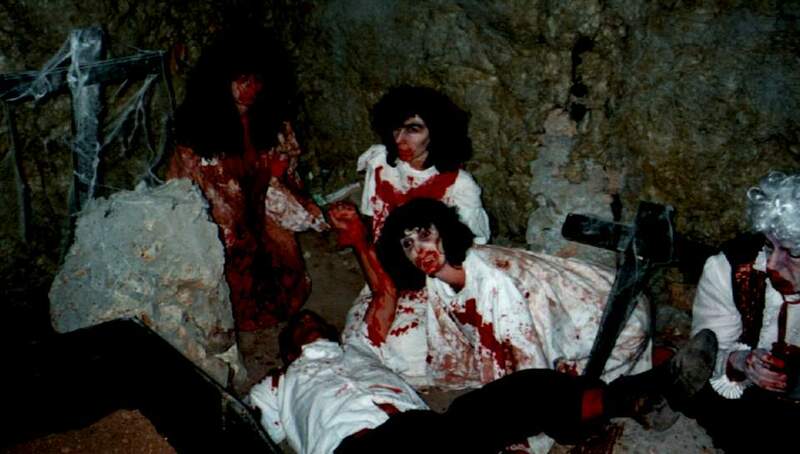 Oh My Gore : "Can you tell us how the filming went during "MALEFICIA" ?" 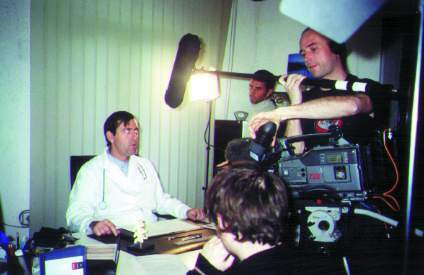 Filming took about 2 and a half years in difficult working conditions. First of all, we're talking about filming with amateur volunteers, that's very important. People, who give of their time, give only just what is needed and not more and it's very hard to reunite them. As they are volunteering most of them always have something else to do on the side. We only filmed during the weekend because everyone works during the week, and eventually at night and so it was difficult getting people together. It was my biggest problem. Otherwise, filming was done in really good conditions, in the end, in a casual manner. You have to understand that while 250 people play in "MALEFICIA", 249 of them can't stand Gore. There's only one person that likes it ! I had to make it somewhat funny so people would come, otherwise they wouldn't have. They'd come at 8 a.m. with their pick-nick and we'd finish around 5,6 or 8 at night. On week-ends, we did that for 2 years. But the hardest thing was trying to get people together. Otherwise, in all it went pretty well. Oh My Gore : "Have you ever wanted a better production ??" Of course, everything I did was auto-produced, at my expenses only. I never asked for one dime from anyone to avoid them from intervening and telling me "I gave you 15$ for this now you have to do this for me...." Everything was financed with my own money so the budget was unfortunatly extremely limited. When you consider "MALEFICIA"'s budget of 15 000$ (counting photo albums, pictures on set, I took a lot of those, something like 3 000 during the shoot, plus all the material...- the movie in itself, make-up, filming, costumes, it cost me around 7 500$) imagine what u could do with a million dollars! Oh My Gore : "Troma distributes you now, how did your relationship go with them ?" It went really well even though it was hard at first to get them to accept the movie. I'm guessing that the first time I sent them the movie 4 years ago, Lloyd Kaufman didn't even get it and the tape must of rested in a corner. So then, my wife goes to New York to do this marathon. So I tell her, "Since you're going to New York and since I'm working, give them my gift", that is my tape, publicity and my resume and of course my press book. So she goes to Troma, just after the marathon, and she's sees this guy at the top of the stairs. So, she introduces herself "I'm Mrs. Pellissier, I've brought a tape of my husbands movie" and the guy's like "well I'm Lloyd Kaufman, the Troma director, please come into my office...". She discusses with him for about an hour, offers her coffee , tapes, DVDs, and my wife leaves after that. Eight days later, I get this message on my answering machine, it was Doug, telling me "Troma here, call us immediately". So I call him back via a friend of mine who speaks perfectly good English and he tells me "Your movie really interests us and we'd like to include it in our catalogue". It obviously came as a shock to me. So after that, I gathered everything they'd asked for during the following two months, all the papers, rights, signatures, the master and I told them that instead of sending all of it, I'm gonna fly over to New York and bring the stuff. In January 2001, we then went over to New York to see Lloyd Kaufman. Small problem, in the contract, it was stipulated the following: "We reserve the right under three months to refuse your movie because we need check it and verify it". Right then, I wasn't feeling so good because I was bringing them really unprofessional work. Three months later, I get the verdict from there laboratories with all the technical aspect and they tell me "Ok, so your movie is worth a 2/5". Technically. "Mr. Pellissier, we're sorry but we can't sell a movie worth 2/5, so try sending us a better master". So I tell them "I can't send you a better master because I've sent you what I had best and I can't give you any more. If I have to do over the movie or the master, I can't, financially, I can't... so do what you want, remaster it, I can't do it." One day I fell apart and told them "Look, I don't want anything, all I care about is being labeled Troma, I'll give you all the rights, I don't care about money". Stand by for about 4 months. Just before the Cannes Festival, they call me up telling me that "MALEFICIA" will show at Cannes and that they've included it in their catalogue. Oh My Gore : "So this is a consecration for you to be on Troma I guess, what do you expect from them ?" I don't expect anything. I hope they'll sell a maximum of "MALEFICIA" even if I don't get anything. They're really great, I really appreciate them and it gives me a great rap ! Oh My Gore : "Your next movies are "HORRIFICIA" and "TERRIFICIA", why choose a trilogy ? And where is "MALEFICIA" in the trilogy ?" Oh My Gore : "After these two movies, what will be your future projects ?" What's for sure is that I'm gonna continue in this direction and try to win the jackpot, that is to say a producer, to take down my practitioner license plate and make it a living. Oh My Gore : "Is there a film you would have liked to direct ?" "EVIL DEAD" ! It all boils down to that. And "NIGHT OF LIVING DEAD" also. As for "EVIL DEAD", from the very first minute to the very last, even though it's little of a parody et there's some funny stuff, you stress out from the beginning to the end, at least the first time I saw it. There's no dead moments. It all goes pretty fast, no lengthy episodes, it's done with very little means, it's great. Oh My Gore : "The third volume of the saga, "ARMY OF DARKNESS", didn't a little disappoint you, because a little more of a parody ?" Yes it did disappoint me. For me, it's really the first two. In "MALEFICIA", it's the opposite of what I'm trying to say: it's not fast tracked, it's a slow moving movie. In fact, it's because I lack means. I want to do something where as at the very first second, the viewer is on his couch, stressing out immediately and that until the very end of the movie. In "EVIL DEAD", there's not too much dialogue, it starts off in the car, they get to the house and bam it starts. That's what I like in movies. Oh My Gore : "What do you think of French cinema ?" Unfortunately, I have a pretty negative view of French cinema, because it really isn't my thing. I'm more American in spirit, like a 100%, I shouldn't have been born French. French people are too focused on their papers. French cinema is mostly situated in movies with a social aspect to them or comedies ("ASTERIX", "3 HOMMES ET UN COUFFIN") or movies such as "AMELIE POULAIN". There's now out of the ordinary movie. I'm backwards from every one else. Everyone likes "TAXI", I don't like "TAXI", everyone liked "AMELIE POULAIN", I don't like "AMELIE POULAIN", everyone liked "LES VISITEURS", I don't like "LES VISITEURS". It's not that I don't like them, but "AMELIE POULAIN", even though it's well filmed, in an original manner and whatever you want, what is it?? All it does is describe for hours the shop around the corner, the butcher, bakery... I can't take it, I really can't. On the other hand, whether I'm in "THE ABYSS" at the bottom of the ocean, or when I'm in "STAR WARS" or when I'm on the farm in "EVIL DEAD", that's when I start feeling emotions. When I'm out on the streets discussing with my butcher or drinking a coffee in bar for hours, I see that every day! Oh My Gore : "And what do you think of other French amateurs like Jean-Baptiste Fauconnier or Pur Production ?" I know Sebastien of "Pur Production" who is a friend of Laurent Tissier, who organized by the way the "Tromatik Festival" (Antoine showed "MALEFICIA", "FOLIES MEUTRIERES" et "L'ELUE DES ENFERS" during this festival). I consider myself old (well, not in my head), but I really think it's great what all these young people are doing. They do really great things, different. I'm crazy about these people. They're like fully engaged in the Fantastic branch, making things different every day. Oh My Gore : "Thanks for this interview, I let you finish..."
Well, thanks to you Oh My Gore, I hope your web site will be enormous, that you'll get billions of visitors. I salute all visitors of your web site. I wish long life to your web site and hope to find happiness via your site, that is a producer. This page has been seen 8469 times.